You’ve probably seen the matcha lattes (also called green tea lattes since matcha is made from the powdered leaves of green tea) at coffee houses, and that’s cool because matcha definitely has benefits, but unfortunately most use sugary syrups and flavorings, or add sugar to their matcha powder. Instead of a sugar-laced latte, we recommend trying this version made with Shakeology. 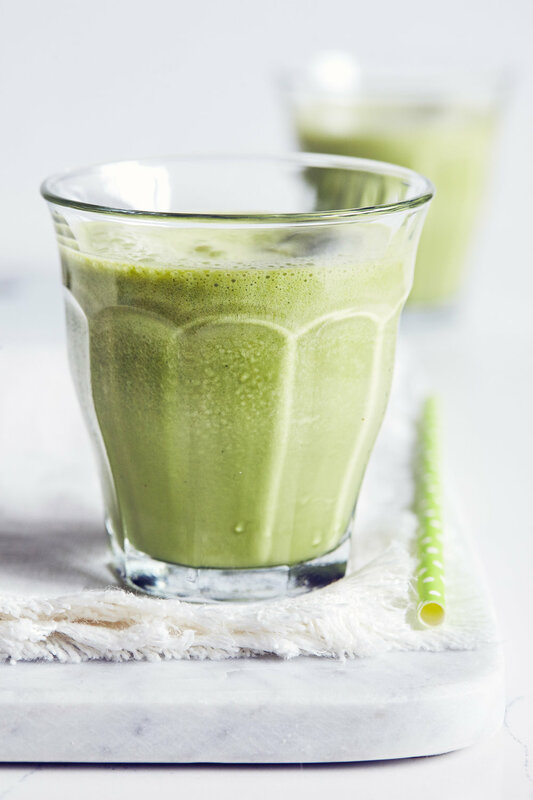 Our version of a matcha latte starts with Vanilla Shakeology (which now includes matcha! ), and then we add additional matcha powder for flavor and color. You’ll find a little matcha goes a long way! So consider using your leftover matcha powder for making other cold/hot beverages like this Matcha Pink Drink or even baking with it as with this Green Tea Ice Cream. When heating up matcha, be aware that it can get bitter quite easily. So when making tea or other hot beverages, try to avoid using scalding hot water, which can cause the powder to taste bitter. 1. Place almond milk, ice, Shakeology, and matcha powder in blender; cover. Blend until smooth. Tip: Make sure the matcha powder you use is unsweetened and does not contain other additives. Refreshing peppermint, creamy vanilla, and craveable chocolate come together in this smoothie version of a Peppermint Patty. The classic candy is a favorite of mint-lovers, but is loaded with sugar, corn syrup, and artificial flavor. This Peppermint Patty smoothie? Even though it tastes like a dessert, it boasts 18 grams of protein to fuel your day. This recipe uses two flavors of Shakeology, so it’s perfect for people have the Shakeology 7-Day Sampler Pack or Barista Combo Pack! It can also be made with either Chocolate or Vanilla Shakeology with delicious results. 1. Place almond milk, ice, Shakeology, and extract in blender; cover. Blend until smooth. 2. Garnish with chocolate and mint leaves (if desired). Orange creamsicles. Who doesn't love them? This recipe is my one of my absolute favourites. Here's a tip: If you buy orange juice, but don’t plan to drink it all at once (we hope not! ), try freezing the unused portion in an ice cube tray. Once they’re frozen, transfer the orange juice cubes to a plastic bag and store them in your freezer. One well of an ice cube tray usually holds about one fluid ounce, so when you’re thirsty for an Orange Creamsicle Shakeology, just pop four orange juice ice cubes (that equals half a cup) into the blender, along with the ice. 1. Place almond milk, orange juice, Shakeology, and ice in blender; cover. Blend until smooth. Can’t resist a plate of peanut butter cookies? Instead, sip this good-for-you Vanilla Shakeology blended with almond milk, Graham crackers, and lots of peanut butter. This Peanut Butter Cookie Shakeology puts all of the flavor of decadent, nutty cookies into your smoothie so you can indulge without guilt. Try cashew or almond butter for a milder flavor, or sprinkle with cinnamon just before serving. Make it a chocolate peanut butter cookie — yes, we went there — with Chocolate Shakeology. 1) Place almond milk, ice, Shakeology, peanut butter, salt, and graham cracker crumbs in blender; cover. Blend until smooth. 2) Garnish with remaining graham cracker crumbs. If you love that middle of the night mocha-from the place that shall not be named-then you’ll totally dig our version with about half the calories and more than three times the protein. So the next time you crave something sweet, just saunter over to that pantry and reach for a little Cafe Latte Shakeology, some unsweetened cocoa powder, and a little pure mint extract (you can find this in the baking aisle of your grocery store). Our Mint Chocolate Smoothie uses the aforementioned ingredients and a little unsweetened almond milk, but you could use milk or any dairy-free milk substitute. This will, of course, change the nutrition info a bit. 1. Place almond milk, ice, Shakeology, cocoa powder, and extract in blender; cover. Blend until smooth. There’s no better time to blend up a pineapple mango smoothie, than when those fruits are in peak season (i.e. now). They pop up in abundance at local markets this time of year, but it can be tricky work figuring out if you’re picking one that’s ripe and juicy. Ever had green tea ice cream before? Green tea (or matcha-flavored) ice cream is no longer limited to neighborhood sushi shops! Ever since matcha became hip, green tea ice cream has become a popular flavor featured at ice cream shops and is now even available in your grocer’s freezer. Unfortunately… most of these versions are jam-packed with sugar and artificial matcha flavoring. But it’s easy to make healthier green tea ice cream at home! During the summer, iced coffee is a must. This eye-catching Iced Cinnamon Almond Milk Macchiato is inspired by the iced beverage served up at coffee houses. If you’re looking for a mouthwatering key lime pie recipe that isn’t full of sugar and calories – and one that is dairy-free – this Vegan Key Lime Dream Shakeology is the way to go. You can still get the taste of the scrumptious dessert, but you don’t have derail your diet to enjoy it. For the best taste experience, use a blender and add ice. The more ice, the thicker it gets. Feel free to use any kind of milk or milk substitute (almond, rice, or coconut milk)—the more milk, the creamier it gets! Enjoy! Nothing says summer like cooling off with a cold glass of lemonade. Enjoy the tastes of the season year-round with this Vegan Strawberry Lemonade Shakeology smoothie. Fresh lemon juice and maple syrup give Tropical Strawberry Shakeology a blast of summer flavor. Amp up the lemon even more by grating fresh lemon zest over the top of your smoothie before serving. Make this smoothie with Vanilla Vegan Shakeology by adding ¼ cup fresh or frozen strawberries. Shakeology smoothie recipe recreates the flavors of the drink with mint, sparkling water and fresh lime juice. But unlike a rum-spiked mojito, this smoothie is actually good for you! Transform creamy Vanilla Shakeology from basic (but delicious!) to bold with two simple ingredients. A teaspoon of caramel extract and a dash of sea salt make this simple smoothie taste like a gourmet Salted Caramel milkshake. Try this recipe with Chocolate or Café Latte Shakeology.